A streetcar for the East End? As the once solidly industrial East End transforms with a 4-month-old soccer stadium, a light rail line under construction and the imminent sale of a 136-acre plot that could signal coming lofts and boutiques, boosters are studying the possibility of reviving the streetcar in Houston after an absence of more than 70 years. Streetcars, which generally are single cars driven by electricity on rails embedded in roads they share with automobiles, are not on a fast track locally. There is no money yet to build even the 4-mile loop – which could cost $10 million a mile – envisioned as the first phase of the project being studied for the East End. Even if there were startup funds, there is no plan to sustain it, since fares alone do not support a system. Greater East End leaders say the area is fertile ground for the rebirth of the streetcar. Its proximity to an estimated 150,000 downtown jobs makes it a potential commuter hot spot. Streetcar line installation costs could be held in check by the use of remnant track on Commerce and other streets in the neighborhood and the possibility of excavating a long-filled tunnel at Preston and Dowling for a low-cost underpass beneath a freight rail line. Streetcars, Greater East End leaders say, would be particularly useful in solving the East End’s so-called “last mile” problem, in which developers are wary of building too far from the light rail line out of a fear that residents and businesses will not buy in because of the prospect of a long walk in summer heat. Even with federal funding and future income from a recently created city tax rebate zone in the neighborhood, the East End needs some of those developers to make bets on the neighborhood to increase the property tax collections that will have to be part of the financing package, said Patrick Ezzell, the district’s planning and infrastructure director. It’s a chicken-and-egg proposition. A streetcar line may attract development, but the district needs development first to raise the tax revenue to launch the line. I’ve embedded a picture of the proposed line, about which you can find more on page 21 of the East End Mobility Study. 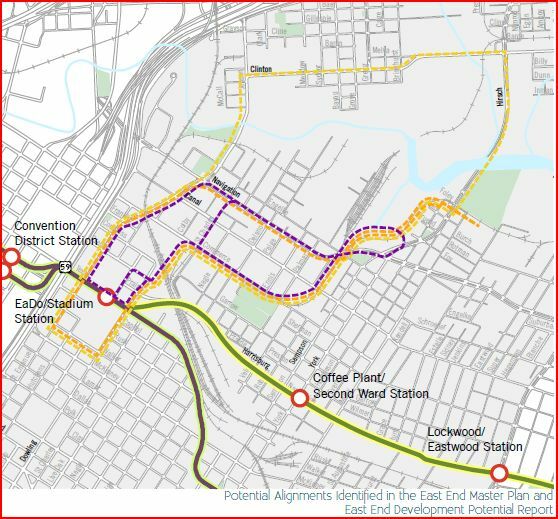 This line would run along the southern end of that massive redevelopment opportunity site and connect it to the Dynamo Stadium light rail stop, as it should. Note also the price tag of approximately $40 million for the whole thing, which certainly makes it reasonable to think about even if there’s no funding source at this time. You should browse through that mobility study because there’s a whole lot more to what the planners have in mind than just this, but a line like this makes a lot of sense for the neighborhood that a lot of people would like this to be. What would you do with 136 acres near downtown?